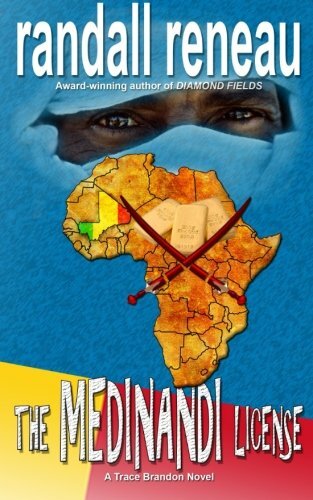 “The Medinandi License” is an action thriller by Randall Reneau that takes you on adventurous travels in your imagination from North America to the sub Saharan Desert in West Africa. Recently losing his fiancée, Geologist Trace Brandon tries to put his life together and accepts work with his best friend Gordon Watson, a mining engineer, on a new gold concession in the Sahel area just north of the African Savannas in Mali. After a couple of months in Mali, his friend is kidnapped by Al Qaeda. Brandon´s original plan to put his life together turns into a rescue mission of his friend with the help of a local armament dealer named Little Babba, a French Canadian ex-mobster, and Molly, Trace´s new girlfriend. “The Medinandi License” is full of action, with excellent descriptions of the geography, the food, drinks, restaurants, and hotels of the Bamako area. Randall Reneau writes with amazing detail and readers will easily imagine being in Mali and feeling experiencing the action firsthand. Although it is a part of his series, which I have not read before, I was able to enjoy this book as a standalone thriller thanks to Randall’s impeccable writing. “The Medinandi License” by Randall Reneau has a lot of guns, adventures, and even a thrilling ride on a Jumbo Jet 747 of Air Dabia, which will make you hold tight to your seat and finish reading this novel as soon as possible. So grab a Castel beer like Brandon or any other of your favorite drinks, and enjoy this mystery/thriller novel set in the Saharan West Africa. I recommend this awesome adventure and great book as a Five Star read to all thrill seekers. I will definitely check out all the other books in his series!